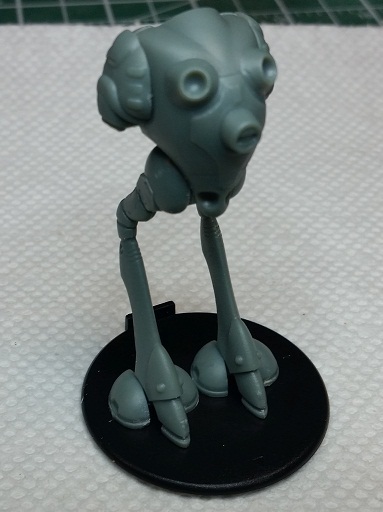 Anyway, I've invested "a bit" in "a couple" of big stompy robot kickstarters over the last few years. Over the last year a few parts of a couple of them have arrived, and recently I've had the urge to get started on painting some of them. Here are a few of the bots to paint. 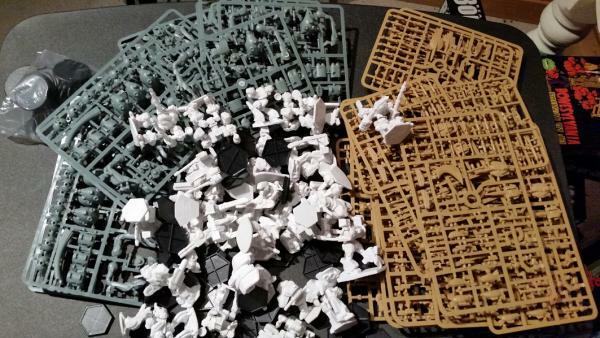 You see the early bird Ace from the Bones CAV kickstarter (in white), and the Bonus add-ons to the Wave 1 portion of the Palladium Robotech RPG Tactics kickstarter (in grey (Zentraedi) and brown/beige (UEDF)). I've also get Heavy Gear Blitz coming at some point. And I wouldn't be surprised if there are some others I've completely forgotten about. 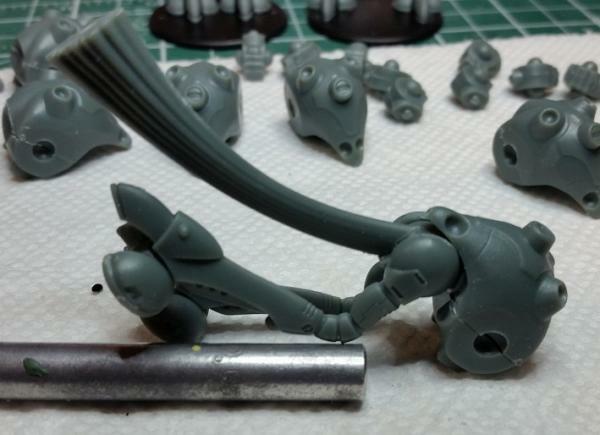 So as you can see, there are a few very different manufacturing techniques here (Bones, hard plastic, resin and metal so far), and ,from what I've looked at, painting bots is a bit different, so I'm going to go through the process and see how they come out. 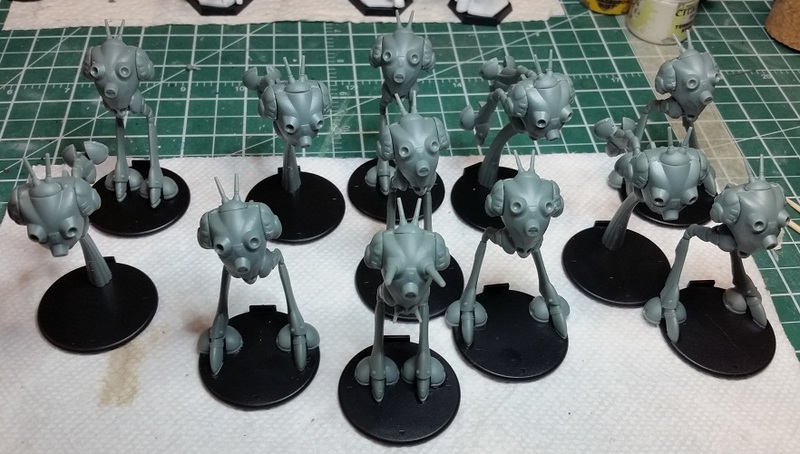 As I'm currently painting some bugbears and working on my fall exchange, my first steps with these will be assembling so regult battle pods and watching videos on painting bots. 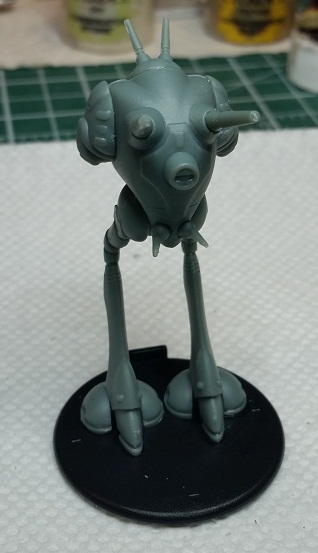 If anyone has any links on bot painting or suggestions on assembling these Robotech (like superglue vs plastic glue...) please feel free to post here. I'm also undecided on the realistic vs cartoony painting of the robotech stuff....thoughts? I'm so jealous of that stack of Sci-fi mecha stuff right now! pleas give us more picture of some assembled stuff. I'd be a happy man seeing some of that stuff up and running! on bot painting google camo specs online. tons of examples of painted battletech minis. for plastic I prefer model glue if it is the right kind of plastic. it actually melts the plastic for a pretty much permanent bond. my painting is generally pretty simple. green or tan base coat with a brown/black wash to bring out the sunken details and sometimes a bit of drybrushing if there is some raised detail I want to bring out. 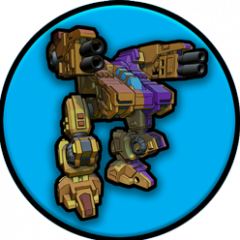 edit to correct typo and add that I think something camo-like is better than a unit paint scheme that stands out more but would make the mech visible at much longer distances. They are supposed to be working on reducing part count for the eventual Wave 2 models. If the Robotech models are polystyrene, then use model glue*. 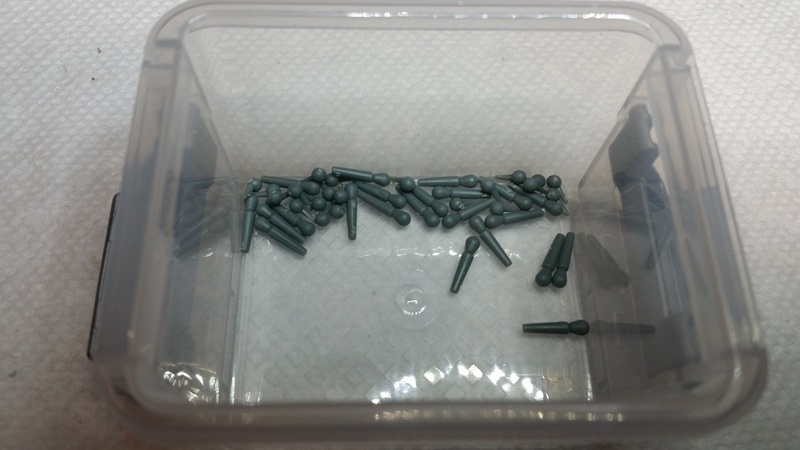 If they're ABS you'll need a spacial solvent glue, also available at hobby shops. If they're soft plastic like the CAV Bones, use superglue. Generally use epoxy for resin unless the piece is really small, then super glue might do. Epoxy is also good for metal to metal or metal to resin. Metal to plastic is can be a bit complicated, depending on what kind of plastic. Generally you'd want to use epoxy to attach hard plastic to metal and a contact cement like E6000 for metal to soft plastic. *Solvent-based model glue will give the best bond, but takes a fair time to dry and needs to be held in place until it does. Superglue will harden faster and probably form an adequate bond for most purposes, but the gases can bond with fingerprint oils and mar the finish of the plastic. Had some time last night while waiting for paint to dry, so decided to tackle the first battle pod. While I have some plastic glue/cement I decided to stick with good old super glue for this one since it's what I'm familiar with. Once I get more comfortable working with these type of models I'll give the other a go. So the torso is 2 parts, plus the hips are two parts. They all went together pretty well. On to the legs and feet. Ok, getting the legs attached to the hips at the same time and in the right standing position is a pain. If you hold the legs tight to the hips then the feet hit each other and knock everything askew...much patience was required to get it looking even. Looks like I also put on the "shoulder" thruster things, likely while waiting for the feet to dry to the legs. Up to 10 pieces. The remaining 5 pieces. Wee tiny. And assembled. Likely took about an hour all told, including clipping and tidying, and waiting on glue. That will come down significantly now that I know what I'm doing. Can do up a bunch of bodies at once, and bunch of legs, and have all the little guns clipped and ready. and so forth. These models bring back memories of youth cartoons. Looking forward to seeing them. It looks like the forward guns are meant to be pretty infinitely poseable. You can give each one its own personality; since there are so many of them you'd probably want some way to tell them apart. Painting numbers on them would do that too, but that's no fun. 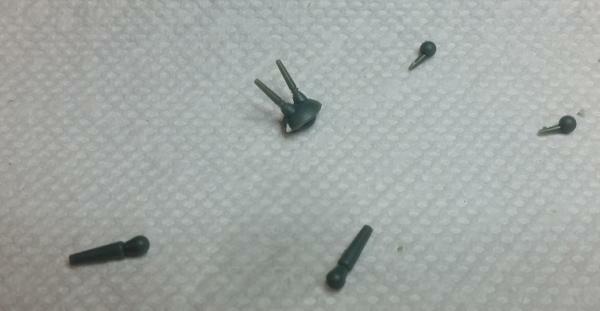 That's the body front and back and the two hip pieces for the rest of the bonus Regult sprues. I also clipped all the weapons and side jet thingys and put them in a separate container from these. 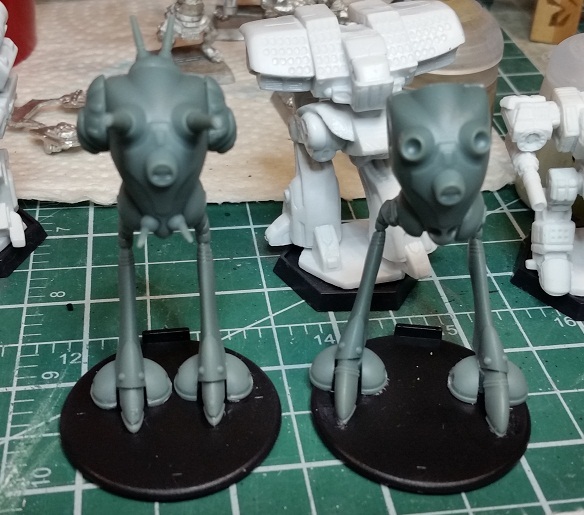 The legs and feet I left on the sprues since they are in pairs so I don't want to mix them up. And I brought up a few CAV to compare for size. 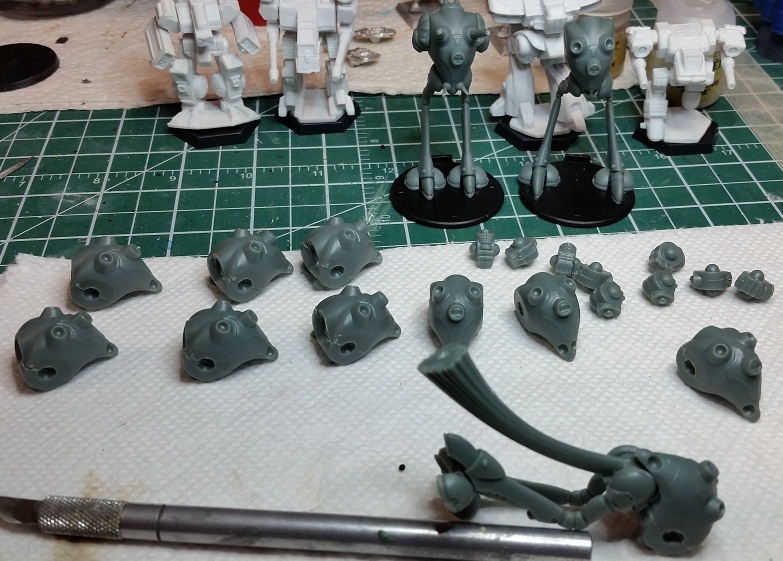 So far they look pretty reasonable in terms of scale (Robotech is supposed to be 6 mm, CAV is 10 mm). I'll need to put together a destroid soon so I can see what the UEDF look like scale-wise. Got started on the mass assembly last night. First cleaned up all the body and hip bits I'd clipped. While doing that I broke out the Testors model cement for plastics. Tested it on some sprue to get a feel for it, and went to work. So all the bodies and hips for the first 12 are together. I've left the hips separate for now, as I'm thinking I can give some a twist to have them looking left or right, so I'll do that when I do the legs. I put the remaining legs from the first sprue on a couple of bodies with straight hips. This is the leaping/jump-jetting one. The joint to the provided flight "swoosh" is fairly weak so I left it off the base until everything cured. I checked it this morning and it feels solid now. 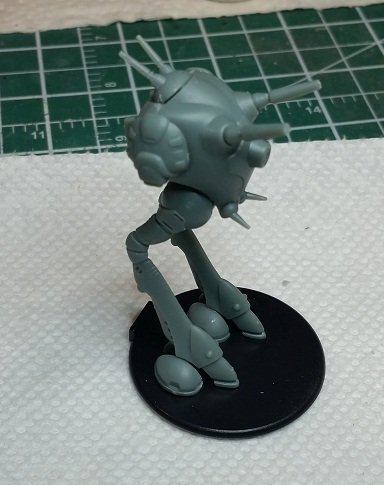 So those are the 3 sets of legs provided. I'll be able to reposition them some, but they don't look like you can mix them up...the height differences are too great. I do plan on checking on the artillery battle pods though. I think they use the same hip setup, so if the legs are different that might add some mix and match options, and add variety to the artillery pods too. Oh, and I don't know who Palladium ticked off at Canada Customs, but the Robotech convention exclusives (which they made available to KS supporters) I ordered are the first package I've EVER had (and I've been ordering stuff since ebay launched....) to be opened by Customs. Once you get an assembly line going you can really crank through these guys. 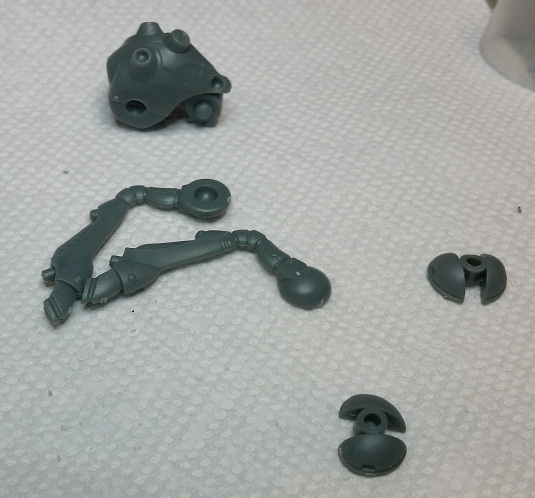 The Testors cement really makes it much easier to get the legs on the way you want. It holds but still lets you adjust for quite some time, unlike superglue. All I have left to do are the main guns and the little ones. 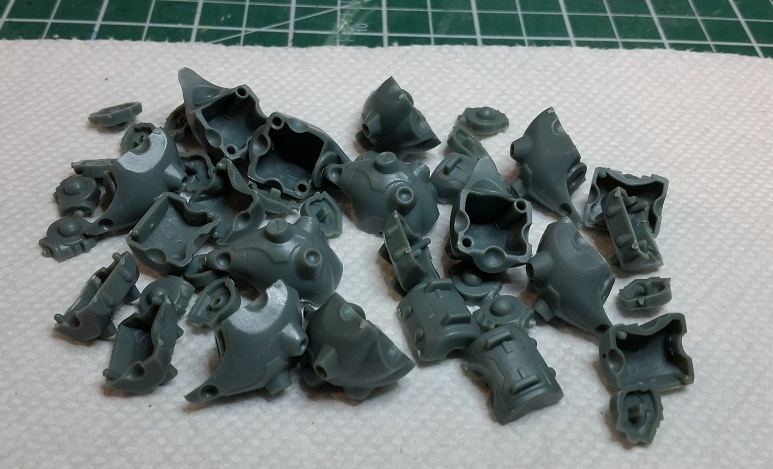 I think I'll use superglue for those little parts so I won't make quite so much mess if I put too much one the "face" of the bots. Got my wife to pick up a magnet variety pack so I can start figuring out what I need if I want to magnetize the artillery battle pods. They have three different weapon options and I'd like to be able to swamp between them. I'll need to order more magnets once I get it figured out, but this gives me the sizes to experiment with. 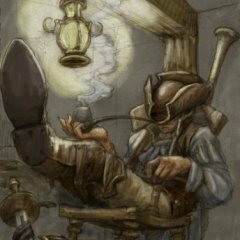 I love this thread, because GIANT ROBOTS! I also hate this thread because it reminds me that I have dozens of my own Robotech minis collecting dust in the basement. 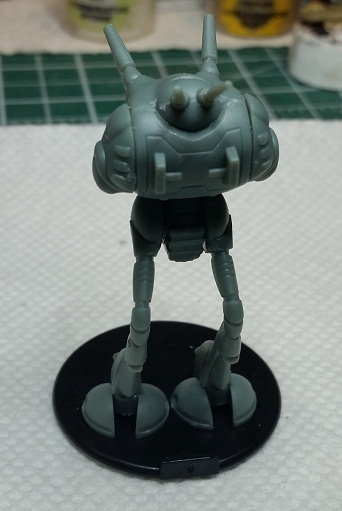 The Robotech minis are ABS. I'm in the same boat I have the RRT starter and some of the addons that still need to be assembled. Finally sort of cleaned up my desk, so there's actually room to work again... Not quite enough room for hubby to work on his side yet, but we'll get there soon. ish. TM. Tentatively calling them the "Fiendish Flying Foxes" or something to that effect, but not fully certain yet hence the title not being as... fluffy as they usually are for me. Kind of want to sneak "fire" in there somewhere too (Fierce, Fiery, Flying Foxes sort of rolls off the tongue), but haven't quite figured that out just yet. ...And yes, I like alliteration, for some strange reason. So, just what do the foxes have, at least so far? ^Initial layout for the bases for my Cataphracts! ^My two Silverbacks, although I suspect more will see the table at some point because I apparently love missiles. I'm not really following any color scheme here, since I am not familiar with the lore of CAV at all (I'm more interested in the game). 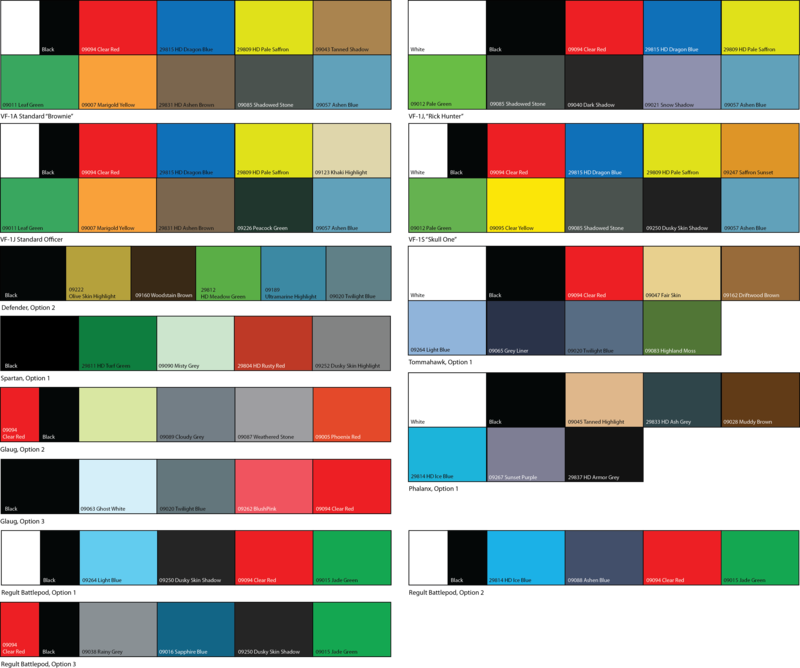 Attached are photos of a slew of different miniatures and projects I've been working on in 2019. The Battleguard Golem is clearly a Warforged Paladin in my mind as was painted accordingly; he's mounted onto a Frontline Games base. The Jungle Titan is on the base of a Reaper Dragon I gave my son as a toy previously. The Galladoria Games entrances are both attached to Frontline Games Stones Dungeon tiles. The Terratiles are from a Kickstarter that started fulfilling last month; they were a ReaperCon vendor in 2017 and make good stuff! On the CAV Thunderbird and Raptor, I wanted to simulate some lights; not as much love for the Kahn. The Thunderbird was missing a shoulder mount so I subbed in a axehead from a long-age discarded figure. The Iron Golem has inspired a monster in my DND world called a Forgeblast Iron Golem and I wanted to simulate discoloration of the iron as though it is being superheated from within; I also wanted it to look as though heat was trying to escape from a few plate patches. Khai the Huntress from Bombshell is on a metal Reaper skulls base; I painted three of the skulls with a glowing green eye to add more interest. Like everyone else, just trying to be creative, get better and have fun. Finished two more miniatures toward the end of 2018. I'm just kind of painting anything I can to work on getting better. Mechs are REALLY new to me! I wanted to paint the Nightshade to remind me of a Romulan Warbird. The Skeleton Knight on Horse was a lot of fun mostly because it's just a series of Vallejo washes with some Reaper MSP to do final highlights.